Note, historic photos are randomly placed and are not associated with any person or persons in this article. The two actresses: Lola Montez, and Lotta Crabtree are correctly depicted. In 1849, by conservative estimates, 25,000 people crossed the plains to California . The number arriving that year by sea, from around the Horn and across the Isthmus, exceeded 30,000 . This immense migration traveling beneath the canvas of covered wagons and the canvas of sails included many surprisingly adventurous women. Among forty-niners traveling the southern route through present-day New Mexico and Arizona into San Diego was a woman with the wonderful name of Louisiana Strentzel, who met eight families in just one party on this road. 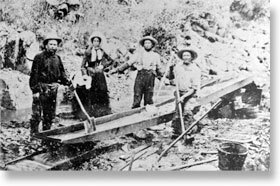 No stranger to gold fever, Mrs. Strentzel wrote from San Diego to her family back home that the latest news from the mines was that “gold is found in 27-pound lumps.” She also wrote that her husband hadn’t been sick a day since they left, and their two children were red and rosy and outgrowing their clothes. She, herself, she wrote, never enjoyed better health in her life. Good health was noted by many women on the trails, who enjoyed the invigorating exercise. 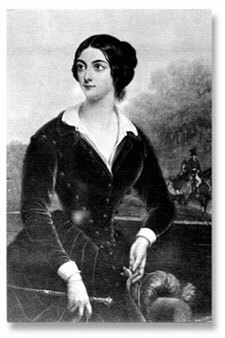 Eliza Rosanna Gilbert, born in Grange, County Sligo, Ireland on February 17, 1821 was better known by her stage name Lola Montez. the Irish-born dancer and actress became famous as the mistress of King Ludwig I of Bavaria. In 1846, she traveled to Munich, where she was discovered by Ludwig I of Bavaria. Ludwig made her Countess of Landsfeld. During the Bavarians’ revolt, Ludwig abdicated, and Lola fled Bavaria for the United States. 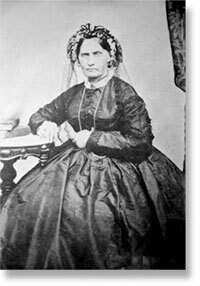 From 1851 to 1853 she performed as a dancer and actress in the eastern United States, then moved to San Francisco in May 1853, where she married Patrick Hull and moved to Grass Valley, California. Lola contracted pneumonia and passed away on January 17, 1861, one month short of her fortieth birthday. Death was far less a casual matter by the time overlanders reached the dreaded desert. The especial cruelty of the long trek west was that the easy part came first. The rolling grasslands of the prairies, encountered in the springtime when people and stock were fresh, should have come last, not mountains to climb when food, animals, and spirit were exhausted. These mountains, the rugged Sierra Nevada, formed the final obstacle to California’s golden promises. They took their toll in wagons smashed and abandoned. There were accidents. But, unless trapped by snow, emigrants had little fear of failing to cross the Sierra. Not so, the hot, dry 40-mile gauntlet of desert lying between the Humbolt River and the Carson or Truckee rivers flowing from the eastern Sierra. Most overland emigrants on the California Trail kept to the tried and true Carson and Truckee routes, but every rumor of a faster, easier way found an ear anxious to believe. At the Humboldt especially, with the dreaded desert ahead and the high mountains beyond, even the most conservative travelers considered a convincingly proposed alternative. In 1849, thousands succumbed to the temptation. Either through argument or the example of the wagon ahead, much of the tail end of that year’s migration turned north from the Humbolt for Peter Lassen’s ranch. They succeeded only in exchanging one desert for another, while adding 200 desperate and dangerous miles to their journey—traveling north nearly to the Oregon border. 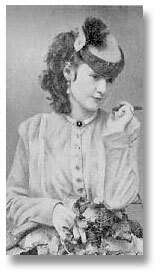 Charlotte Mignon Crabtree was born in 1847 in New York City to parents John Ashworth Crabtree and Mary Ann (Livesey) Crabtree. In 1851, her father left for San Francisco looking for gold, Lotta and her mother followed in 1852. The family reunited in Grass Valley, California to run a boarding house for the miners. It was here, Lotta met actress Lola Montez and became her protégé. Lotta made her first professional appearance at a tavern owned by Matt Taylor. Lotta began traveling to all of the mining camps performing ballads and dancing for the miners. In 1856, the family moved back to San Francisco where Lotta toured Sacramento and the Valley, and became frequently in demand. By 1859 she had become "Miss Lotta, the San Francisco Favorite". Lotta retired in 1891. The profits from her career, wisely invested in real estate all over the country during her tours, allowed her to lead a comfortable life. At her death in 1924 she left an estate of four million dollars. No one can measure the fear and suffering endured by these people on the Lassen route, or by those on the desert crossings to the Truckee and Carson rivers, or on the southern trail into San Diego. But the fear and suffering of emigrants on another route into California could not have been surpassed. In October of 1849, from a camp south of Salt Lake City, more than 300 people followed Jefferson Hunt, a guide familiar with the Old Spanish Trail to Los Angeles. A pack train overtook them, and in it was a man with a map showing a cutoff from this trail. The tantalizing prospect of short-cut immediately danced in the minds of impatient emigrants. The temptation was too much for a Methodist minister named John Brier, who fired others with his zeal for the cutoff. Although Jefferson Hunt refused to take it, on November 4, 1849, approximately 27 wagons did. Among them were four families, including the Briers. Their path took them into a vast and desolate desert, a hellhole they would name Death Valley. Thirty-four men, mostly young and mostly from Illinois, calling themselves Jayhawkers, entered the desert valley. Three of them died there. The Rev. Mr. Brier, his wife Juliet, and their three young sons followed the Jayhawkers in a desperate search for a way out. 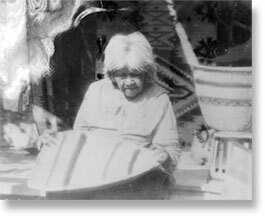 Juliet Brier earned the Jayhawkers’ great respect and affection, one recalling that in walking nearly a hundred miles through sand and sharp-edged rocks that she frequently carried one of her children on her back, another in her arms, and held the third by the hand. 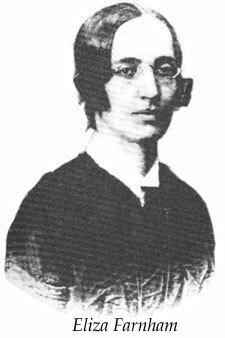 At Jayhawker reunions she was spoken of as a heroine for caring for the sick among them. The Brier family, with much suffering, reached safety on February 12, 1850. The other three families lost in Death Valley also survived. The Wade family celebrated deliverance on February 10. The Bennett and Arcan families, heroically rescued by two selfless young men, escaped the valley of death on March 7….four months and three days after their fateful decision to take the cutoff. And she did. Her first necessity, of course, like all women new to California, was a home. California offered few comforts, however, and almost nothing homelike. “Oh! you who lounge on your divans & sofas, sleep on your fine, luxurious beds…know nothing of the life of a California emigrant. Here are we sitting on a pine block…sleeping in beds with either a quilt or a blanket as substitute for sheets (I can tell you it is very aristocratic to have a bed at all)”…. In towns, of course, were hotels – if one stretched the definition. The celebrated St. Francis Hotel of San Francisco opened in 1849 and was so high class even then that it boasted it offered sheets on its beds. No other hotel did. A 49er woman living in Santa Cruz knew about thin walls, too. She was Eliza Farnham, a widow who had come round the Horn with two children and a woman friend to claim property left by Eliza’s late husband. Eliza Farnham, who conquered a stove, built a house, and put her Santa Cruz land to growing potatoes, quickly recognized that women in California would have to work. And indeed 49er women did work. Some even mined. A newspaper editor saw a woman at Angel’s Creek dipping and pouring water into the gold washer her husband rocked. The editor reported that she wore short boots, white duck pantaloons, a red flannel shirt, with a black leather belt and a Panama hat. 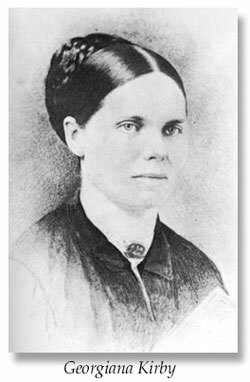 In full agreement was Mary Ballou, who kept a boardinghouse in the mines. Her complaints included the additional inconvenience of unwelcome animals. A Husband Wanted... By a lady who can wash, cook, scour, sew, milk, spin, weave, hoe (can’t plow), cut wood, make fires, feed the pigs, raise chickens, rock the cradle, (gold rocker, I thank you, Sir! ), saw a plank, drive nails, etc. These are a few of the solid branches; now for the ornamental. “long time ago” she went as far as syntax, read Murray’s Geography and through two rules in Pike’s Grammar. Could find 6 states on the atlas. Could read, and you can see that she can write. Can—no, could—paint roses, butterflies, ships, etc. Could once dance; can ride a horse, donkey or oxen…Oh, I hear you ask, could she scold? No, she can’t you _____________good-for-nothing _________! Of course there were all kinds of ways women could earn a ‘little gold,’ and they did. Catherine Sinclair managed a theatre. A French woman barbered. Julia Shannon took photographs. Sophia Eastman was a nurse. Mrs. Pelton taught school. Mrs. Phelps sold milk. Mary Ann Dunleavy operated a 10-pin bowling alley. Enos Christman witnessed the performance of a lady bullfighter. Franklin Buck met a Spanish (“genuine Castillian”) woman mulepacker. Charlotte Parkhurst drove a stage for Wells Fargo. Mrs. Raye acted in the theatre. Mrs. Rowe performed in a circus, riding a trick pony named Adonis. And some women danced, some sang, some played musical instruments, some dealt cards, some poured drinks. What readily comes to mind with the subject of gold rush women are these saloon girls and parlor house madams. And who were these so-called soiled doves? They were Chilean, Mexican, Chinese, French, English, Irish, and American. No stereotype encompasses them all, for they and their experiences were as diverse as the population. A few were phenomenally successful, most merely survived. Despite popular 19th century assumption that women were driven into prostitution by seduction and abandonment, most pursued the profession for economic reasons. Among the first, believed to have arrived in San Francisco in 1849, was a Chinese woman named Ah Toy. She was a ‘daughter of joy,’ the Chinese expression for prostitute, but she was more than that. She was an extraordinary woman. First, she was independent of any man, Chinese or Caucasian, remarkable for an Asian woman. Second, she spoke English, also most unusual for a Chinese woman. Third, she was assertive and intelligent, for she quickly learned to use the American judicial system, regularly taking her grievances to court. Obviously, she was adventurous, determined, hardworking, bright, independent, aggressive—the very qualities of a successful 49er. 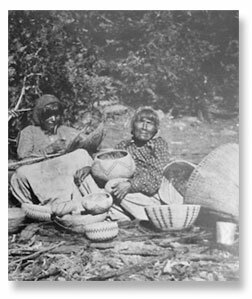 She shared those qualities with thousands of pioneering women who demonstrated the courage and determination required by the unique circumstances of gold rush California. And yet when most people think about 49ers, they think of them as men. And yet, women – women with gold fever like Louisiana Strentzel, suffering overlanders like Sarah Royce and Juliet Brier and Catherine Haun, the boardinghouse keepers like Mary Ballou and Luzena Wilson and Mary Jane Megquier, potato growers like Eliza Farnham, the pie makers, the washerwomen, the seamstresses, prostitutes, actresses, circus riders, nurses, teachers, wives, mothers, sisters, and daughters – women were 49ers, too. 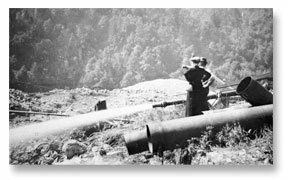 JoAnn Levy has been writing about California’s gold-rushing women for more than twenty years and is the author of the now-classic They Saw the Elephant: Women in the California Gold Rush. Her first fiction, Daughter of Joy, A Novel of Gold Rush San Francisco, won the 1999 Willa Award for Best Historical Fiction. A second novel, For California’s Gold, captured the prize in 2001, after debuting at the National Archives in Washington, D.C., where Levy spoke in honor of Women’s History Month and California’s statehood sesquicentennial. Just released is a “biographical gem,” Unsettling the West: Eliza Farnham and Georgiana Bruce Kirby in Frontier California, in which Levy recounts the lives and adventures of two remarkable women, pioneer reformers who touched history and made history. A frequent speaker on behalf of the gold-rushing women she discovered in nearly a decade of research, Levy has been featured in numerous TV documentaries. Unruh, John D., Jr., The Plains Across (Urbana: University of Illinois Press, 1982), p. 85. Holliday, J. S., Rush for Riches (Berkeley: University of California Press, 1999), p. 94. Megquier, Mary Jane, Apron Full of Gold: The Letters of Mary Jane Megquier from San Francisco, 1849-1856, ed. Robert Glass Cleland (San Marino, Calif.: Huntington Library, 1949), Letter dated Panama, May 14, 1849.